I’ve fallen behind in my regular posting, mainly due to one of the most challenging and rewarding commissions I’ve done recently. More on that later, but first, artist question number three! 3. Show us your oldest piece of art you have on hand. I’m certain that I have older art than this on my external drive, but since I can’t access that at the moment, here’s the oldest piece I could get. It’s over fifteen years old! This was drawn in pencil and coloured in a very old version of Photoshop. I’m pretty sure I used a reference for it, but that’s been lost to time. Surprisingly, for a piece of art that’s this old, I don’t completely hate it! I mean, water doesn’t really work that way, the sky looks terrible, and I relied way too much on Photoshop filters, but it’s not all bad. If I had to do it again (and maybe I will, just for fun), I would make the waterfall more natural-looking and gravity-obeying, the rocks and trees would be painted with texture rather than just having a texture filter slapped on, and the entire sky would be different. But it’s still not as embarrassing a result as I thought I would find. Lately I’ve been working on a lot of stuff that I can’t show yet, but one of my British wrestling clients has released the t-shirt I designed for him. Spike Trivet is a wrestler known for his upper-class snobbery and tendency toward violent matches. In his most recent one, he was injured when he was thrown through a mirror and got a shard of glass in his leg. This t-shirt design commemorates that fight and is available to order here. This is honestly one of the most difficult commissions I’ve ever done, mainly due to the amount of detail and need for perspective in the background, but I had a blast figuring it all out and I learned a lot from it. The colouring was also a challenge since I was given a limit of five colours, preferably Victorian ones. I’ve never really worked with a limited palette before, but I chose the colours from a sample of Victorian paint, and again, I’m quite happy with it! Also I have realised that, for someone with a very low tolerance for blood in TV and movies, I find it fun to draw! I’ll have a lot more to post very soon. In between commissions, I have been developing more of my personal projects, and I can’t wait to share my ideas! I missed Sketchbook Sunday yesterday. I kept thinking it was Saturday all day! So here it is, one day late, before I exile myself from the internet again to work on commissions. I’ve drawn my cat Buster for Sketchbook Sunday before but wasn’t very happy with it, but I am this time! I was watching TV with my husband last Monday, and Buster was sitting in his chair with her paws up on the arm of it looking so cute that I had to grab my iPad and draw her right away! She may become a more frequent sketchbook subject if she continues to be this cute all the time! I got the idea for this part-unicorn creature after watching a couple of Guillermo del Toro films, especially Pan’s Labyrinth. I just love the monsters and creatures in his movies. (There will probably be an Amphibian Man sketch in a future post!) This doesn’t look much like a del Toro creature, but still, seeing them inspired me. I plan on turning this into a full creature design; I just haven’t decided if it will be more human-shaped or more centaur-like. My sketches on Wednesday and Thursday were done quickly because I didn’t have a lot of free time. I’m not entirely happy with them since they’re pretty standard, generic character designs. I feel like I could do something more interesting with them later. 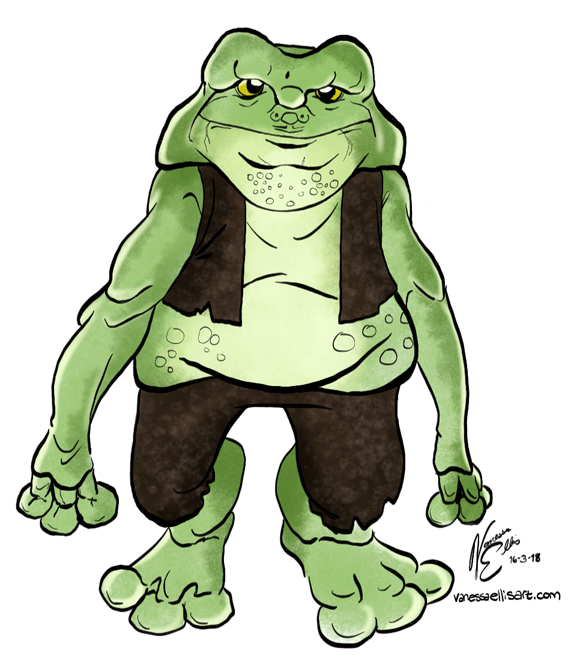 At some point during the week, I saw a photo of an adorable, lumpy little frog, and thought ‘I can make a creature out of this!’ And here is my first drawing of him! There are things I’d like to redo, like his arms and giving him more creative clothing, so you can probably expect more frog designs in the future, too. When I can’t think of what to draw, I draw The Zeta Project! Saturday was not a very creative day for me, since I was working to finish one commission and start on the next, so I fell back on my old favourite. Here’s Zeta and his human form Zee, both in running poses. And one last sketch before I disappear to work on a new wrestling t-shirt. 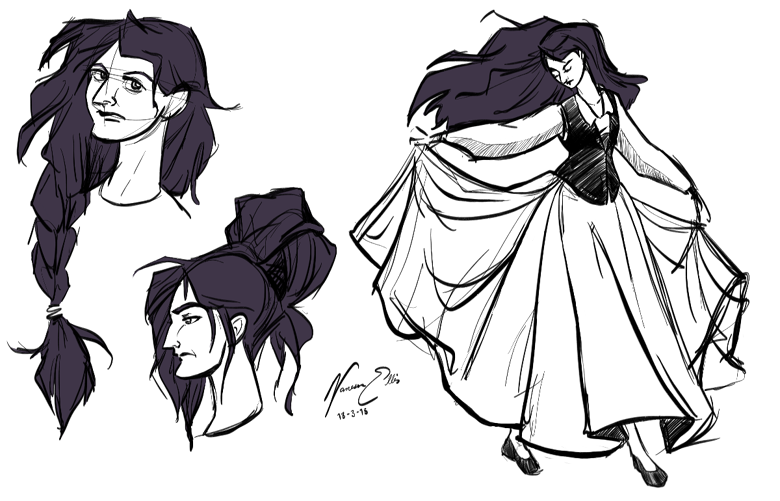 An old character, slightly redesigned, from a fairy tale story that I keep telling myself I’ll write one day. Maybe one day soon. I have a lot of time for drawing now, after all! Don’t forget to check back on Wednesday, when I’ll embarrass myself by digging up the oldest piece of art I can find! 2. What art-related sites have you ever signed up for? I signed up for DeviantArt ages ago, and more recently made a new account for my freelance work, which is the one I link here. I like DeviantArt because, of all the sites I’ve signed up for, it gives the best sense of community and interaction. I really need to get it more up to date! I have portfolios at Coroflot and Carbonmade. Both have been pretty much abandoned. I don’t like Coroflot’s layout and have had no interaction there, so it’s been abandoned. I like Carbonmade’s look, but there’s no community, and all the job offers I’ve had through that site haven’t been legit. Most recently I’ve signed up for Instagram. I’m still learning how to use it properly, but I love it so far! On Sunday, I’ll have a new sketchbook post ready, and next week I’ll be looking into my old files to answer question #3: What is the oldest piece of art you have on hand? I’m very happy to announce that one of the projects I’ve been helping with recently is now available! “One Day I Swear I’ll Reach You” is a visual novel by SetsunaNoroi that works something like a choose-your-own-adventure book. In it, you play as an up-and-coming YouTube gamer invited to speak at a convention. There, you meet the Let’s Play YouTubers Markiplier, Jacksepticeye, and Matpat, and depending on the interactions you choose, you can either earn their respect and friendship or alienate them and destroy your popularity online. While it’s made with dating sim software, it is definitely not romantic in nature, as that would be crossing a line that SetsunaNoroi understandably did not want to cross. Even though I know very little about Let’s Play, I had a lot of fun with this project and it was definitely a learning experience drawing on my new iPad. I drew three characters with five facial expressions each, plus the game’s creator for the end. Jackskepticeye was the most fun. He’s so expressive, which made drawing cartoon versions of him easy and fun. I’ve played through two scenarios of this game so far and it’s great. You can really see the amount of dedication that SetsunaNoroi put into it, and how much these three mean to her, especially in her very touching message at the end. And with all the recent controversy surrounding a YouTuber not associated with Let’s Play, this game sets Let’s Play and these three YouTubers in particular apart as people who care about their viewers and truly love what they do, rather than just being in it for the popularity. I think this game should be played not only by fans, but by anyone thinking of starting on YouTube. It really gives a sense of perspective. On to the weekly Artist Question topic! I mentioned recently that I found a list of questions from reblogger-ocelot on Tumblr that I wanted to answer once a week, and now that I’m mostly caught up on projects, I’m going to get started! 1. When did you get into art? No sketchbook post this week either. The bad news is that it’s been a little harder for me to keep up with daily sketches, especially after catching a bad cold. The good news is that I’ve also been kept busy with a lot of freelance work, including t-shirt designs for British wrestlers, a game, and new tabletop RPG art! I can’t share any of it yet, but hopefully I can very soon. I am also going to try to start selling prints this year. I have a new account with Society6, which is empty for now due to the fact that all the stuff I wanted to sell is apparently too small for printing. Oops! In between freelancing, I’m going to work on redrawing some things at a higher resolution, so watch for updates on that later! Starting Wednesday, I’m going to be making a weekly blog post based on this list of questions from reblogger-ocelot on Tumblr. If anyone has any questions that aren’t on this list or suggestions for things you’d like to see on my blog, please let me know in the comments! I will not be available to take commissions or freelance work from July to around mid-August. During that time I will be preparing to apply for my second Further Leave to Remain visa in order to continue to stay in the UK with my husband. This will be a very stressful time for us, but if all goes well (and there’s no reason it shouldn’t!) then I’ll be able to start again in late August. This week, it’s all black and white sketches, some of them unfinished, because I’ve mostly been working to finish a commission. Two of the sketches are also missing from this week’s update, because I sent them to a client as samples, and they want those specific drawings! When that particular commission is finished, I’ll include those sketches in that week’s Sketchbook Sunday. Wednesday’s sketch is based on an old painting that I did for my mom. I don’t have it anymore, it’s still with her back in the US, but I wanted to see how it would look if I redrew it. 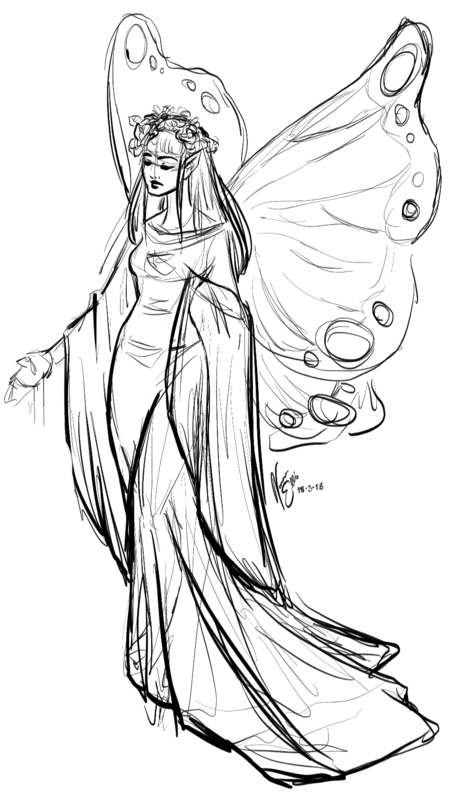 It’s a ladybug fairy inspired a bit by Amy Brown’s fairies. This is one that I may finish later and, as soon as I work out how I want to do this, sell prints of it. 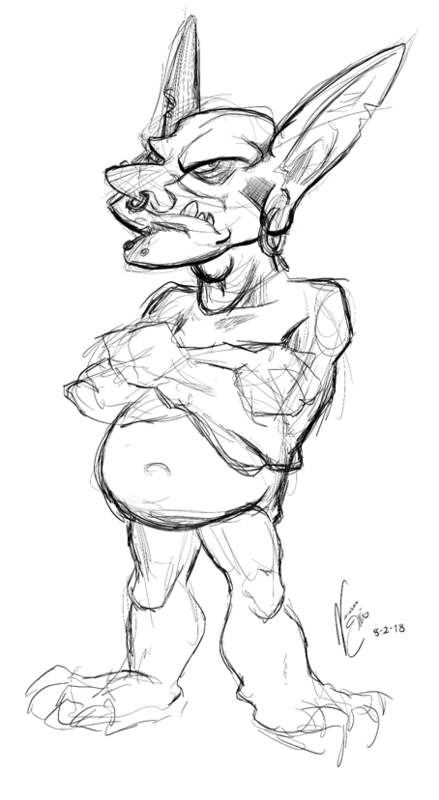 Thursday’s sketch is a grumpy little goblin. He was meant to have clothes but I ran out of time, so he’ll have to have some later. He’s a bit different compared to the goblin I drew for Thunderhead Games, but I wanted to try something a little different, and I’m happy with his design. If anyone has any idea for what sort of clothes he should be wearing, let me know! And here’s some fan art that did not start as fan art. The pose came first, and then I thought I would turn it into Ro Rowen from The Zeta Project, but that didn’t quite work out. I changed her clothes to something a bit more asymmetrical and dystopian, with some elements from The Zeta Project thrown in. This is the Ro of a darker TZP – but when you think about it, under its bright colours and cute characters, The Zeta Project is already a dystopia. This is a future where the government sends shapeshifting robots to spy on you, and they’ll kill you even if you’re innocent! Pretty dark already. And here’s today’s sketch! My husband hadn’t seen much Star Trek before we got married, so I’m introducing him one series at a time. We’ve finished The Original Series and The Next Generation, and have now moved on to Deep Space Nine. 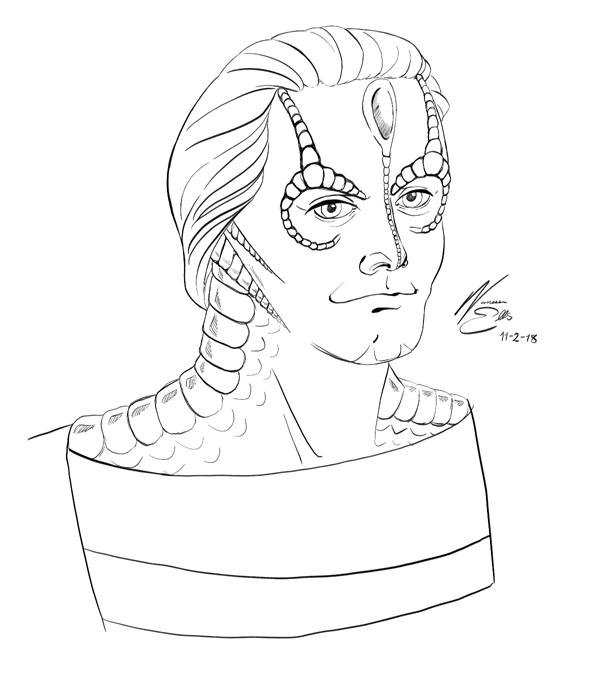 One of the last episodes we saw was “Past Prologue,” which introduced one of my favourite characters: plain, simple Garak, who is most definitely not a Cardassian spy. And that’s all for this week! Let me know if there are any sketches you’d like to see, and I’ll include them in a future sketchbook post. I also have plans for semi-regular non-sketchbook blogging, so keep an eye on this page for more updates! Three more sketches from the last three days, and then I’ll get back to only uploading sketchbook things on a Sunday. My cat Buster! 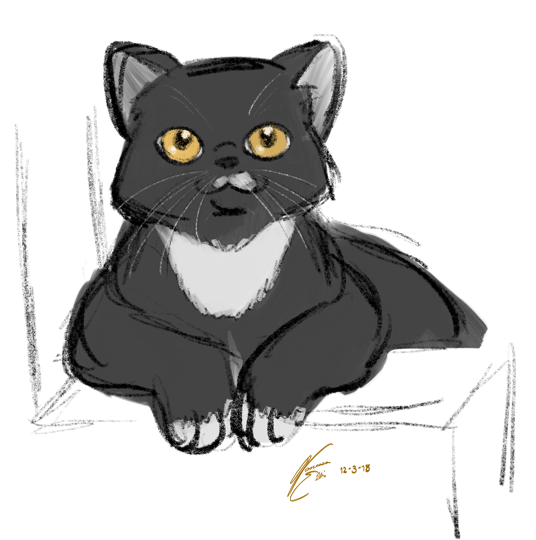 I’ve always thought I was pretty bad at drawing cats, so on Friday I decided to challenge myself. Pretty happy with this one, although I think I need to make her eyes a little more round. On Saturday I had no idea what to draw. I overslept, then went to a friend’s party and had a fantastic time, then came home to eat dinner, and there was little time in between for drawing! 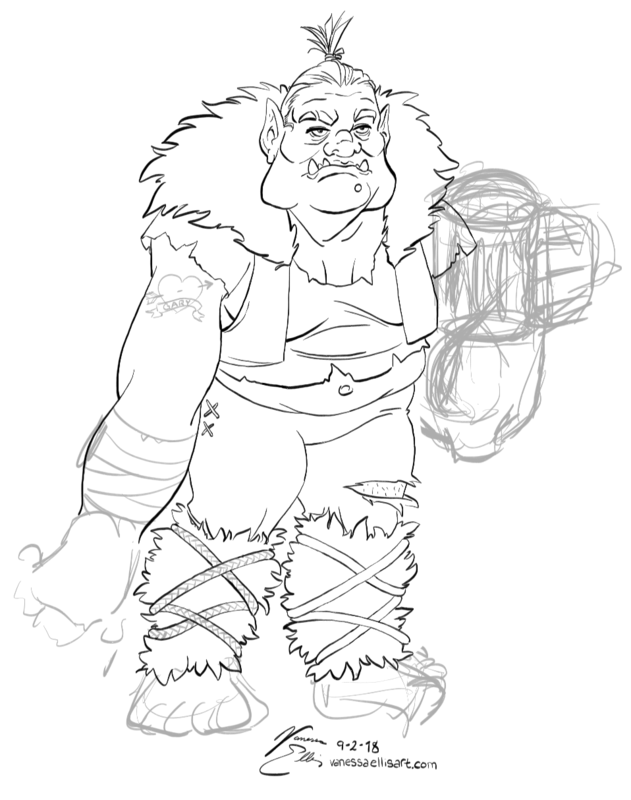 Still, I’m determined to not make excuses, and managed to get a quick D&D-like character done before bed. She is very mysterious. I think she may be a witch. If you follow me on Instagram, you’ve likely seen everything in this update – the only difference is that I get to ramble on a bit more here! January was a busy month for me, as I was still at my old job for half the month, then got the flu, and then went to Liverpool. But now I’m back home, feeling much better, and getting things done. To start with, I cleaned my desk area. I like a bit of clutter, but when things are too disorganised, it makes it easy to procrastinate. So, here’s the newly-tidied section of the bedroom where I do all my drawing. I’m currently working to finish a commission quickly, but I’m being a bit of a perfectionist about it. The client is a new friend, and someone who’s close to my best friend of 15 years, so it’s very important to me that I get it done right. 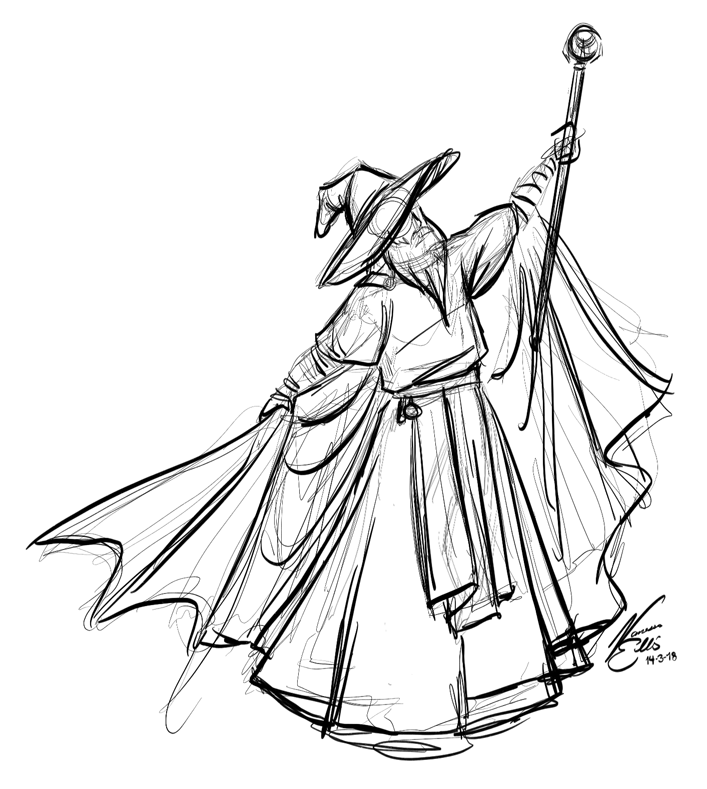 Today I have finished the last of three character designs, so all that’s left is to make a few modifications. I’ll post them here when they’re ready. Mermaids have always been one of my favourite subjects to draw, ever since my dad taught me to draw them when I was a little girl. I love every kind of mermaid, from the more human-looking ones to the monsters, and the first picture is meant to be sort of a blending of the two. She’s an easily bored mermaid who amuses herself by luring ships to crash on the rocks. The second one is one I’d like to redraw in more detail when I have the time. My husband picked up a magazine from somewhere that had a painting of an Elizabethan lady on the cover. I thought that I would like to draw something like that, but of course I would have to make her a monster! The headdress in the painting became my lady’s horns, and I made up my mind that she would be part-dragon. I started to give her some wings but I didn’t like how they took focus away from her face, so maybe she’s just shapeshifted into a form that doesn’t have them, or maybe she’s a wingless Dragonborn! To start this month, I’ve done a sketch based on a story I started just before I moved to the UK, and one that I hope to get back to writing this month. I used this image by faestock as a reference. And that’s all for now! Even though I’ll be drawing something new every day, I’ll probably limit myself to only posting new sketchbook pages once a week. If you’d like to see them a little more frequently, check me out over on Instagram! I have finally finished my last day of work. Maybe one day I’ll post about the experiences, good and bad, that I had there, but right now I’m just relieved that it’s over. Today, I took the day off. I slept in. I had a good breakfast, instead of skipping it like I usually do. I watched some Star Trek with my husband, and I got a bit of cleaning done, especially in my desk area. Tomorrow, I go back to the work I really love, the work that was going very well before I gave in to the idea that I needed a day job. Tomorrow, I get back in touch with clients and start catching up on commissions and personal projects. It’s a bit scary, starting over again, but it’s even more exciting, and it’s absolutely the right thing to do.